EAG Laboratories is an industry leader in ESD testing (Electrostatic Discharge) and Latch-up testing. Our highly experienced engineering team uses their industry leading knowledge and years of real world experience with the latest semiconductor technologies, circuit design, and device physics to optimize our customer’s ESD and latch-up results. When you choose EAG, you will be working together with recognized experts in the field of ESD testing and latch-up testing. We are committed to providing our customers with the most up-to-date testing methodologies, along with technical interpretation of the test data and accurate assessment of the results. Our in-house PCB team can also create custom ESD fixtures quickly to help speed your time to results. In addition, EAG’s ESD team is part of a much larger service organization that provides customers ready access to world class failure analysis, environmental / reliability testing, FIB circuit edit, electron microscopy and ATE test services. Raw waveform files for all curve traces done on all pins. Data available for download at FTP site (30 days); archived for 5 years at EAG. Quoted on a per job basis, based on a statement of work and an hourly fee for extra engineering work. Although latch-up testing is performed on the same automated testers as ESD testing, the tests are dramatically different. ESD testing is an un-powered test, whereby pins receive voltage pulses with well-defined combinations of grounded pins on the device under test (DUT). Latch-up testing is performed with the DUT powered, and signals applied to the part to place it in a stable, low current configuration. A specialized ESD/LU worksheet is used to set up automated testers, such as the Thermo Scientific Mk2 or Mk4. Each tester channel has the unique ability to be programmed as a power supply, signal pin, or vectored pin. The goal in IC latch-up testing is to trigger and monitor a potential latch-up event, where the stress pulse activates a parasitic “Silicon Controlled Rectifier” (SCR) structure within a CMOS or Bi-CMOS process technology. 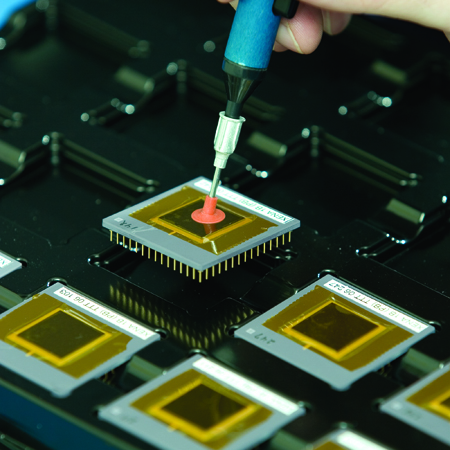 Latch-up testing is fundamentally about the chip physical layout, how circuit blocks are situated relative to one another, and how unanticipated charge is removed from physical elements in the semiconductor material. Latch-up testing is done according to the last revisions of the JEDEC latch-up specification, JESD78B, JESD78C, JESD78D, or JESD78E. Testing can be done at a customer specified ambient temperature, from 25°C to 150°C. Because there are so many variables, latch-up testing is quoted on a case by case basis, based on the statement of work, estimated engineering time to create a working test, machine time to execute the test, and customer requested reporting. Transmission Line Pulse testing, or TLP testing, is a method for semiconductor characterization of Electrostatic Discharge (ESD) protection structures. In the Transmission Line Pulse test, high current pulses are applied to the pin under test (PUT) at successively higher levels through a coaxial cable of specified length. The applied pulses are of a current amplitude and duration representative of the Human Body Model (HBM) ESD/LU worksheet request event (or a Charged Device Model – CDM – event in the case of Very Fast TLP, or VF-TLP). The incident and reflected pulses are evaluated, and a voltage-current (V-I) curve is developed that describes the response of an ESD protection structure to the applied TLP stresses. The Transmission Line Pulse test is unique because the current pulses can be on the order of Amps, and the TLP test results can show the turn-on, snap-back, and hold characteristics of the ESD protection structure. TLP testing is done according to the ESDA TLP test method, ESDA SP5.5-2003. TLP is quoted on a case by case basis, based on the scope of the work requested; estimated engineering time to perform the test, and customer requested reporting.